Agnes or Aggie Shine and her sister, Maggie, Margaret, taught Sunday School at the church. R. J. Shine/R. Shine (13/6 and 20/9) we believe are the same person, her brother, Richard Shine. 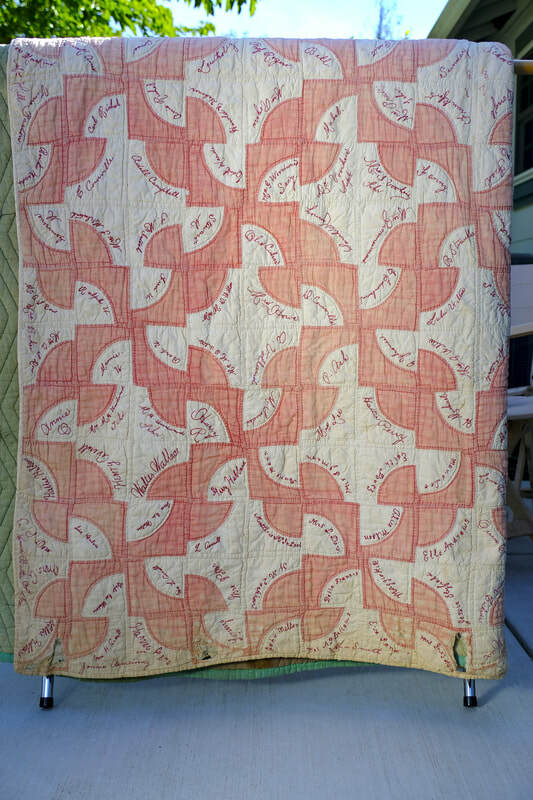 This quilt has traveled with my family from Frankfort, MI, to Kalkaska, MI, where John Durkee passed away in his 30's from a dementia and paralysis of his heart caused by a form of tuberculosis you get from drinking cow's milk from an infected cow. My Great Grandmother, Agnes, eventually moved her family to Tacoma, WA. The quilt then traveled to Kellog, MN (to a farm outside of Kellog), where her daughter, Irma, lived. Irma Durkee Barton moved to Pleasant Hill, CA to live with us after my Grandfather passed. 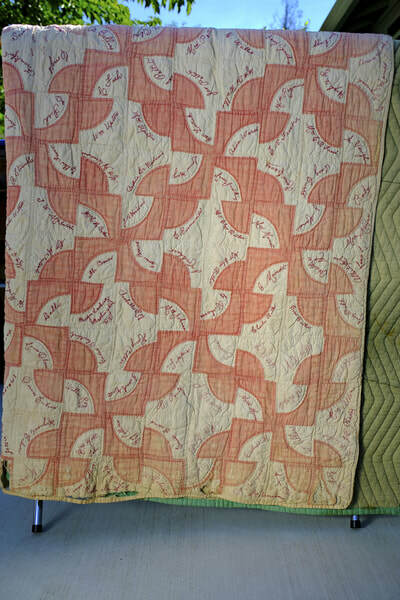 My Dad, Donald R. Merchant, found the quilt in a plastic bag out in a shed. Mice had been living in it —creating the damage. F. P. BATES 2-3/1-1 = Rows 2 and 3/Squares 1 and 1. 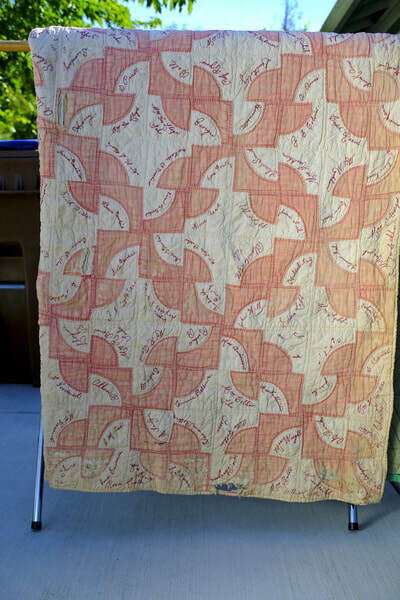 We had to hang the quilt on a rack to photograph, which changed Mr. Fritz to the lower right-hand corner. Others are welcome to reinterpret names and spellings. I would spell something one way and find a better embroidery that spelled it differently. I went with the clearer spelling. One that stands out is Slyfield or Styfield. Many spellings looked like Slyfield. Then I saw one with the (L) crossed like a (T). As there were more that looked like L, I kept that spelling. Some C's and E's, H's and K's, etc. are difficult to know which is which. The person who did the Hibbard or Hillard names, did l's the same way so it was difficult to know in this case if the name was Hillard or Hibbard. I went with Hillard. As my husband, Dennis, finally said to me, "It is not going to be perfect." We were using a very bright light, magnifying glass, and sometimes taking a picture on our phones and expanding it. Someone else hopefully will recognize names and spellings. At least three people did the embroidery. As you look at the quilt, some names seem to be connected. This can be in a "square," horizontally, or two names in one square, etc. 1 started to connect some names together, but that became very confusing too. I added a last name in parentheses indicating I thought they were connected. I only did a few names. Maybe between all of you, the Historical Society and Dinah Hagg, you will figure out who is who and who belongs to whom. Hope this makes sense. I have become just a little rummy working on these names to get the list and quilt ready for donation to your Benzie County Historical Society. The only names familiar to me are Aggie Shine, my Great Grandmother, Agnes. J. H. Durkee, my Great Grandfather, John Henry Durkee. They were both born in Ontario, Canada. He was a baker. I thought they had a confectionary in Frankfort. They were married March 21, 1888. Maggie Shine and E. E. Shine are her sisters, Margaret and Elizabeth. R. Shine and R. S. Shine are her brother, Richard Shine. We think Allie Durkee was John's sister but don't know.